New Year’s Resolutions – Go Ahead, Make Some. It’s January in Michigan, which means my days are spent driving in inclement weather dressed in as many down garments as possible, with the seat heater on full blast while occasionally eating baked goods and drinking soy mochas. Now that the glitter of the holidays has been swept away and only the grim prospect of four more months of cold and grey skies remain, one must look for the bright spots in the sportscar-devoid winter landscape. 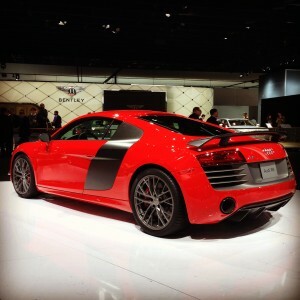 One of such bright spots is the North American International Auto Show (NAIAS), a.k.a. the Detroit Auto Show, which opened this week in Cobo Center. Chris Harris recently wrote a (not-so-nice) piece in Jalopnik where he marveled why in the world NAIAS would be scheduled in January, in the middle of the cruel Midwestern winter, in a city which at first pass would seem to have very little to offer. There are a few reasons why, but let’s focus on the most important one: because part of keeping the car market alive involves creating excitement when all of us are sick and tired of looking at the salt on our car’s paint and going hoarse from wondering why drivers forget how to drive in winter conditions every single year. We need the autoshow to literally fan the flames to keep us believing that one day in the future, the slush will recede and driving on clear roads with the windows down will once again excite us. It’s the NAIAS message of hope. So without further ado, I present to you seven things to do at the 2015 NAIAS (and one after), suitable for visits with or without kids. Get out to Detroit, get that fire back in your automotive soul, and let me know what you think! One of my favorite aspects of car shows is how brand displays are small worlds where the folks who love and support the brand congregate. I can always tell which visitor is in his or her favorite car neighborhood by the looks on their faces and their attention to detail. I love watching the wide-eyed looks cars like Ford’s new GT get, but head over to where the trucks are and you’re bound to see someone madly in love with the newest F150. One man’s treasure – take the Dodge Challenger, for example – is another woman’s trash because she’s starry-eyed over the new Mazda MX-5. NAIAS reminds me that technological advances definitely matter, but when it boils down to it, people connect with cars at a much deeper level. The Cayman GTS blends in at the Porsche display. Speaking of connecting with (or failure to connect with) cars, the Porsche exhibit was one of the least exciting I have looked at in years. Yes, I said it…I was bored by my favorite manufacturer and their apparent lack of effort. Sure, the Cayman GTS is beautiful. 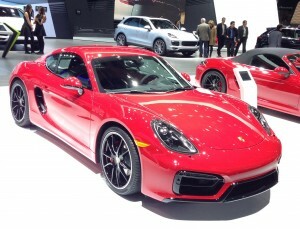 Of course Porsche’s hybrid cars are cool. And yeah, the Targa 4 GTS is really pretty, and look there’s the Cayenne Turbo S – both have even more horsepower for your commute to work. But where is the showpiece car? Why no GT3? The 919 Hybrid LMP1 car was in Detroit for a WEC press event – why not roll it onto the display and let those of us who cheer on it take a closer look? My husband had a great point: “if you don’t bring any wow cars out – the cars that made us put the posters up in our bedrooms as kids and encouraged us to dream about having a Porsche one day—how will you build the excitement that translates into a devoted customer?” I agree. The Porsche display didn’t say heritage, motorsport, naughty fun. It said, law school, real estate, medical practice. And while there is absolutely nothing wrong with these venerable professions (and realistically people who buy a Porsche need to earn in a certain bracket), I don’t believe that is how you build a life-long connection with a customer. Porsche’s current strategy may mean that more people buy their cars, but that kind of customer is probably more likely to trade their Porsche in for the next car with more HP that catches their whimsy vs. stick with the brand. Growth is good, but don’t forget devotion in the process, Porsche. 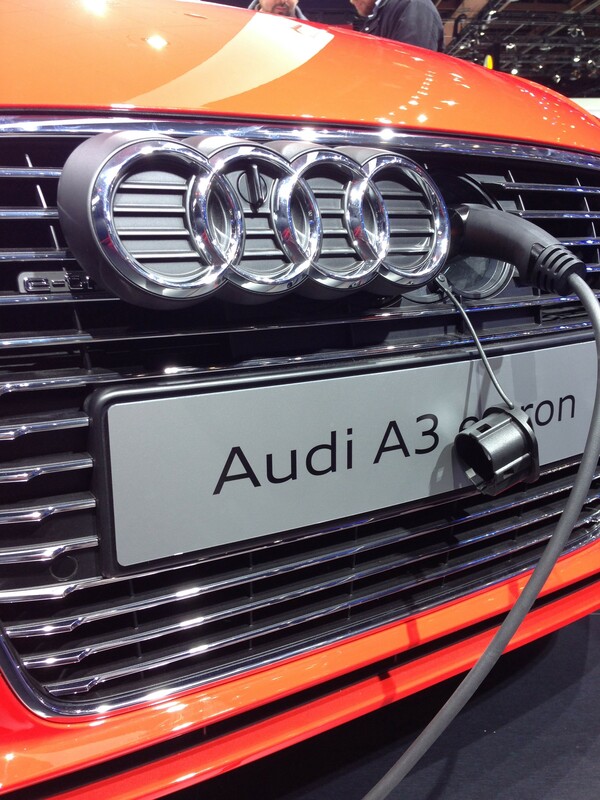 Audi A3 eTron – the future of motoring. One of the most enjoyable things to do at car shows is to check out the prototypes and hybrid vehicles. While electric cars are still expensive, in just one year, the technological advances continue to advance, and most manufacturers (from Chevrolet to BMW to Audi and Porsche) feature hybrid electric and electric vehicles. You may not be in the market for one today, but in a decade…maybe. We found three driving simulators at NAIAS. Our favorite simulator, in the Mazda area, offers a pass at racing an MX-5s around Laguna Seca. My husband made quite a few friends there, especially on his second try when he posted the top lap times of the day and had to confess that yes – he had done this before. The Dodge Charger Challenge (where you sit inside an actual Charger mounted on a hydraulic system which moves appropriately as you drive) was equally fun, especially when we befriended a Detroit police officer whose daily driver was a Charger (he posted the top time in this case). Honda, too, has two simulators, which let you step inside a helmet and take a few laps around Mid-Ohio in an Indy Car. If you want to give these a try, be prepared to wait in line, and be sure to check in with the staff as you wait to ensure they know you want to drive. While previous skills on a simulator are not needed to give these a try, do bring a healthy ego: while you drive, many will be watching and judging your performance, sometimes in a very vocal way. In addition to the simulators, Ford offers two interactive displays near their truck display: one which shows how their lane assist technology works, and another which showcases how much faster their park assist would be vs. your own efforts. Neither was too impressive. I drove the lane assist simulator like a maniac and it provided feedback, but I didn’t find it too helpful, particularly because it waited until I was well in the highway trench before attempting to help me. Both my husband and I beat the parking assist, except when he was horsing around using parking techniques which we often observe around town (8 moves to get into a spot, tapping cars in front/back and parking a couple of feet away from the curb ). …and he can do yoga, too. Tires are the Rodney Dangerfield of the car world: they can’t get no respect. The average consumer doesn’t think about tires except when they have to. Well, NAIAS is the perfect opportunity for you to learn more about the insane amounts of technology that goes into creating your car’s shoes – the stuff can be quite fascinating, especially when you are not under pressure to replace tires. The folks at the Michelin exhibit (by the Subaru exhibit) are friendly and knowledgeable and you’re sure to leave a better-informed consumer. 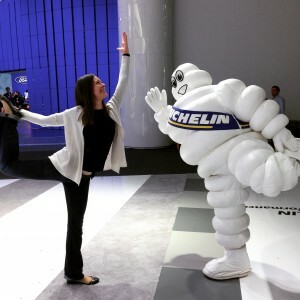 This year, Michelin offers an additional treat: visit their area and you can make a celebratory video with various props including confetti, checkered flags, a trophy and even The Michelin Man if he is available. Head into the booth and make your own Slow Motion Victory Celebration (here’s mine for inspiration). If anyone can miraculously turn rubber into something adorable, The Michelin Man can, and he will be wondering around the NAIAS throughout the weekend, posing for photos with a big smile and a thumbs-up. Food is often a challenge at NAIAS. Unless you want to feast on roasted nuts, pretzels or M&Ms, I suggest taking snacks with you, especially if you have little people tagging along. Salads and sandwiches are available outside the exhibit hall, but there are few restaurants close by outside of the Hall. The R8 looks good from every angle. If you need a break from all the artificial lights, noise and stale air, head to the Ford display’s Innovation Park. This elevated “park” features faux greenery, sounds of water and birds, and oddly-shaped wobbling chairs. Yes, it’s all fake – but it works wonders. A few minutes there, and you’ll feel refreshed – a bright reminder of just how much we all benefit from being outside in nature. Kudos to Ford for putting this little oasis in the middle of their gargantuan (but elegant) displays. Speaking of massive displays, a few manufacturers have a large presence at NAIAS. The “big three,” of course, are there in full force. But manufacturers like BMW, Audi and VW also had quite large, customer-friendly displays. These German marques have a vehicle for just about everyone, and this is the perfect place to check out their models thoroughly (although some cars, like the R8 and M235i, to name a few, will have locked doors to prevent people like me to get in there and set up camp). Personally, I enjoy looking at how each marquee differentiates their models. At Audi, I found some cars beautiful – S4, R8, A3 – while finding others better in their previous iteration (Q5, Q7, TT). If you love to compare models side by side, NAIAS is the place to do it. 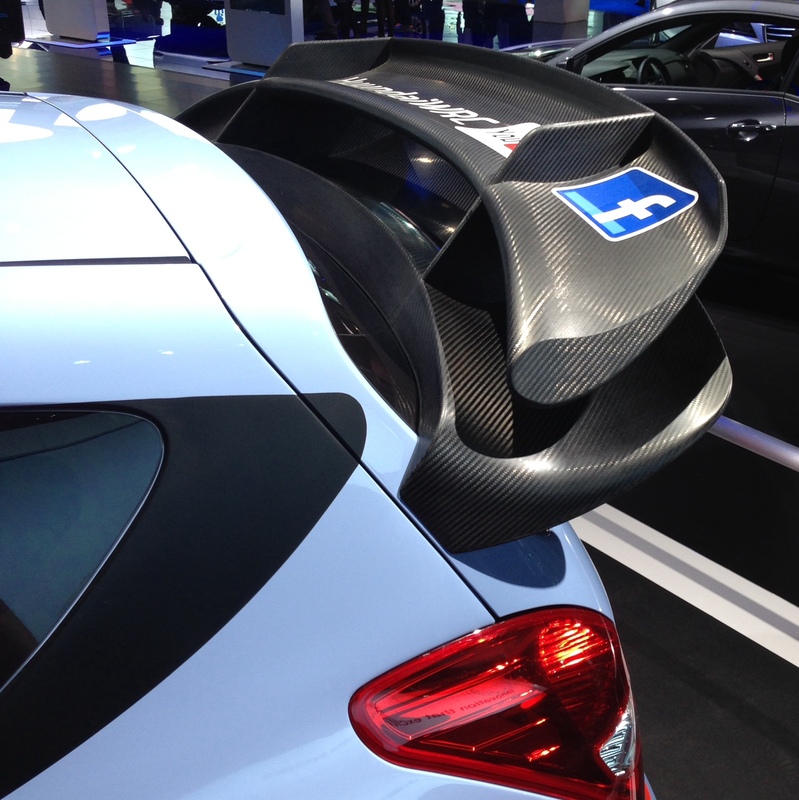 When carbon meets art: the Hyundai i20’s wing. Quite a few manufacturers have their rally and race cars on display, and you can get quite close to them. One of my favorites was the Hyundai i20 WRC car, which had the coolest wing—an artful double-whip of carbon— I’ve seen in a while. Next to the car is a screen showing video of the Portugal rally which is sure to leave you wide-eyed and smiling. Over in the Ford neighborhood, Ford’s Fiesta ST Global Rallycross car is also a fun sight, as the Fiesta’s familiar and sensible looks are transformed with its RedBull wrap and various rally trimmings. 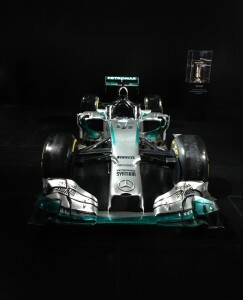 Winner winner chicken dinner: Lewis Hamilton’s 2014 F1 champion steed. Both Infiniti and Mercedes have 2014 F1 cars on display, which is a true treat, because unless you make the trek to Austin TX (or live there), this is the closest most of us will ever get to these masterpieces of automotive engineering and aerodynamics in the US. The Red Bull car, former ride of my favorite Seb Vettel, was fun for me to see, but I was quickly reminded that things have changed, as the car on display already sports Kvyat and Ricciardo’s names. 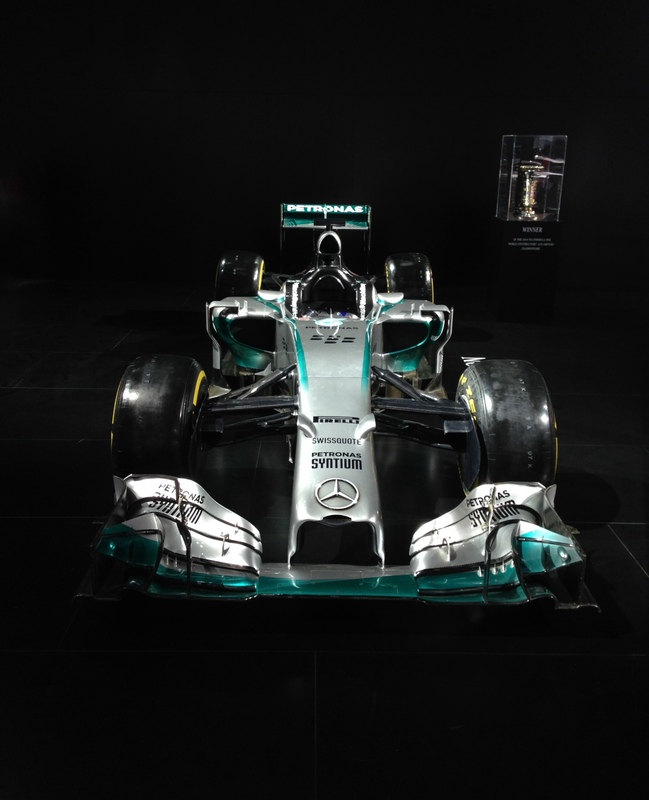 The star of the Mercedes display is, of course, Lewis Hamilton’s 2014 winning car, the Mercedes AMG W05 Hybrid, which is displayed next to the 2014 F1 Championship trophy. The lighting on this display is so pretty, you may just feel like you’re at the Louvre looking at the Mona Lisa…until you smell the scent of roasting peanuts which is a permanent fixture of COBO Hall. We wrapped up our visit to NAIAS with a fantastic dinner with like-minded car friends. If you plan on eating in Detroit after the show, you will be very pleasantly surprised, as quite a few innovative restaurants are popping up in the city. One of my favorite Instagrammers to follow for Detroit restaurants is @mightyinthemitten – her photos have inspired me to try more than a few Detroit places with very good results. The NAIAS is open to the public between January 17-25, 2015 at Cobo Center, Detroit, MI. If you go, say hi to the Michelin Man from me.